On the 75th anniversary of the evacuation of 300,000 allied forces from the beaches of Dunkirk in 1940, The Dunkirk Project will be sharing breaking news of what was happening day-by-day live every day from Tuesday 26th May to Wednesday 3rd June 2015. Follow amazing personal stories of courage, heroism, triumph, despair, and downright eccentricity through the Nine Days Wonder, in the wake of ‘the little ships of England that brought the army home’. 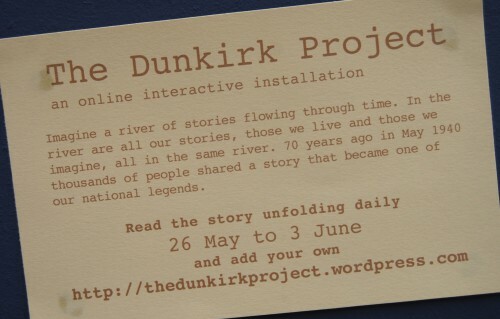 Since 2010, The Dunkirk Project has been collecting material on Dunkirk 1940 in a River of Stories: not only extracts from a mass of published accounts and reports, but also many unpublished accounts from archives, and memories and eye-witness stories from individual contributors. This entry was posted on	May 19, 2015 at 11:58 am	and is filed under Work in focus.